Furthermore, Cuba lost the favorable and stable terms under which most of its trade took place. In addition to “coordinated supply plans” and exports, it is reported that Soviet subsidies and aid to Cuba averaged at $4.3 billion a year for the period 1986- 1990.4 Regarding the Soviet subsidies, it should be emphasized that Cuban authorities do not consider them as financial aid but simply as credits and assistance to development. Whatever the interpretation of the Cuba-USSR preferential relationship, it is clear that because the island lost the external support that had sustained its economy, it was forced to develop a new strategy for reinsertion into the international market economy. After 1989, the Cuban economy went into recession, with the real GDP decreasing by more than 40% in the period 1990-1993. The implementation in September 1990 of an austerity program called “special period in time of peace” stimulated a more pragmatic stance toward economic policy and led to the adoption of specific measures aimed to foster a recovery, while at the same time ensuring the survival of the socialist system and the major conquests of the revolution. In a gradual but clear departure from strict central planning, the Castro government introduced some capitalist-style reforms such as the legalization of the use of U.S. dollars in the Cuban economy, authorization of self-employment, breakup of the state monopoly on land and establishment of agricultural cooperatives, restructuring of the state bureaucracy, and creation of free farmers markets. The active promotion of international tourism was also crucial in keeping the economy afloat and laying the foundations for future growth. Nevertheless, the main innovation was the opening of the island to foreign private capital, a significant change for a socialist country whose economy had previously been under exclusive Cuban state ownership and control. The promotion of foreign direct investment (FDI) was conceived by Cuban authorities as a way to assure the diversification and promotion of exports, acquisition of raw materials, insertion into new markets, acquisition of technology and capital, and introduction of modern practices of management.5 Following a cautious start, when a handful of hotel and oil exploration joint ventures were formed, foreign investment in Cuba gathered speed after 1993 as the economy began to show signs of a modest but steady recovery. Since then, an increasing number of foreign companies have entered the Cuban market with investments in nearly all sectors of the island’s economy, from mining and tourism to financial services, manufacturing, oil, energy, construction, food processing, and agriculture. However, after more than a decade of growth, the number of joint ventures with foreign firms fell significantly in 2003, raising questions on just how wide the Castro government’s welcome to foreign investment really is. Although it should be acknowledged that the level of interest on the part of foreign investors has diminished, the recent decline in the number of international economic associations (Asociaciones Económicas con Capital Extranjero, or AECEs)6 is mainly the result of Cuba’s increasing selectivity toward foreign investment and its unwillingness to create a more attractive business environment. President Fidel Castro and other senior officials have never concealed their intention to keep foreign ownership and capital in the communist island at a minimum level. They insist that foreign investment is a complementary measure aimed to help strengthen and improve the country’s state-run socialist system, not destroy it. While acceptance of new investments is based on strict consideration of what they can bring to Cuba in terms of capital, technology, and markets, the Castro government has made clear that it wants to keep overall state control of the economy. Additionally, Cuba has done very little in solving the recurring problems mentioned by overseas partners, which include excessive bureaucracy, project approval delays, payments problems, and restrictive labor legislation. On the contrary, recent moves by the island’s authorities to introduce foreign exchange controls for state-run enterprises and other centralizing economic measures have lowered confidence among existing and potential investors about their ability to deal with bureaucratic hurdles and collect payments and arrears from the Cuban government. Given this situation, it is hardly surprising that the number of active AECEs in Cuba decreased for the first time in more than a decade. Any attempt to carry out a comprehensive analysis of foreign investment in Cuba is hindered by the lack of reliable and detailed information on the activities of foreign firms and their contribution in terms of capital. Due to what Cubans call the “U.S. economic blockade” against the island, public disclosure by the Cuban government of data on the presence of foreign capital in Cuba is limited to statistics on the evolution of international economic associations by year, by sector, and by country. This method of reporting the level of foreign investment in the country offers no idea of the value or strategic importance of the deals involved. Nonetheless, this paper utilizes the best available information to date from a variety of sources (some of them confidential) in order to provide an overview of foreign business activities in Cuba, with particular attention on recent developments and new strategies implemented by the Cuban government. It begins with an analysis of the evolution of foreign direct investment (FDI) in the island and the main results of international economic associations (including the AECEs operating abroad) in 2003 and 2004. It continues with an examination of other forms of investment such as cooperative production agreements with overseas firms and operations in Cuba’s free trade zones. Finally, it uses some indicators of AECEs and other available data to analyze the economic impact of FDI on the Cuban economy. The opening to foreign investment and international tourism, matched by increasing interest but also growing complaints from foreign companies, led the government to enact an updated and more investorfriendly legislation in 1995. Law 77 of 1995, while repeating some of the basic aspects of the 1982 Decree- Law 50, set out specific guarantees for foreign firms by establishing full protection and security against expropriation, and opened all sectors of the Cuban economy (except public health, education services, and armed forces) to foreign investment. It also abolished the limit of 49% of foreign shares for joint ventures and authorized for the first time the possibility of 100% wholly foreign owned investments. Finally, in an attempt to speed up and streamline the approval process of new agreements, the law introduced an article requiring the approval or denial of an investment within 60 days of the presentation of the formal request. After 1993, Cuba intensified the promotion of foreign investment. Through visits to foreign countries, participation in international investment events, and meetings with potential investors, Cuban officials have been very active in publicizing the advantages of business activities in the island.8 As a result, the number of international economic associations has grown steadily and expanded to different sectors of the Cuban economy such as mining, construction, light and food industry, agriculture, and services. What’s more important, small enterprises with low amount of capital invested gave way, to some degree, to larger associations (such as joint ventures with Canada’s Sherritt International in the nickel sector, and Italy’s STET in telecommunications) including large capital investments as well as new and more modern operations. An important policy change toward foreign investment occurred in 1998 when the Cuban authorities declared their preference for economic associations that involved higher amounts of capital and loan financing. In fact, as a result of banking reforms and continued economic recovery, Vice President Carlos Lage announced that year the intention of the government to pursue a strategy of encouraging foreign investment in large development projects while limiting smaller projects, unless they included the introduction of new technologies or new export markets. He added that Cuba’s government-operated banks were in a position to provide small amounts of capital. 9 For instance, in 2000, direct investment agreements mainly included large projects in oil, energy, construction, and telecommunications.10 The government has also continued to promote joint ventures in the tourist sector for the construction of hotels and resorts for international tourism mostly from Canada and the European Union. Cuba’s increased selectivity on foreign investment is demonstrated by data on authorized and dissolved international economic associations (Figure 1). Between 1988 and 2003, a total of 585 AECEs were formed in Cuba, most of them joint ventures; at the end of 2003, only 342 remained active, sharply down from the 403 reported for 2002. 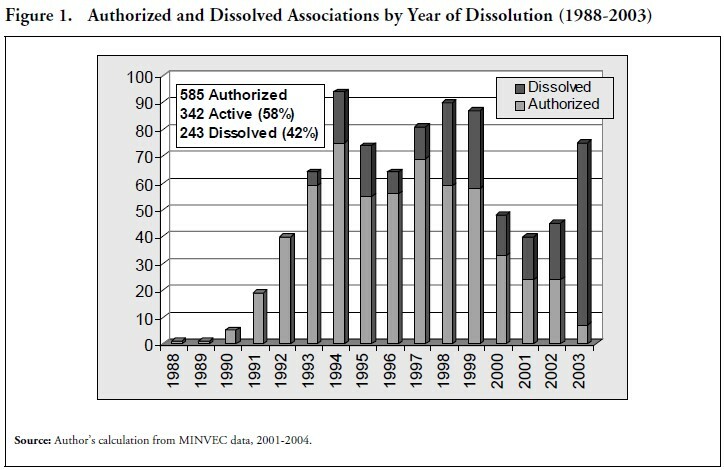 The number of dissolved AECEs is 243, approximately 42% of the total constituted. The number of active associations, which had been increasing at an annual rate of around 32% between 1993 and 1997, rose by just 5% per year between 1998 and 2002, and dropped by 15% in 2003.11 This is not surprising, considering that about 74% of dissolutions occurred in the last 6 years. However, it should be noted that the number of authorizations steadily declined during the same period. Interestingly, the Cuban Ministry of Foreign Investment (MINVEC) reports that another 67 international economic associations operating in Cuba are in the process of dissolution.12 Therefore, unless a significant number of new agreements are signed in 2004 (or perhaps most of the contracts of the AECEs in the process of dissolution are renewed), it is possible that the total number of active AECEs will be lower than 300 at the end of 2004. If this is the case, then Cuba would have lost more than 25% of associations with foreign partners in just two years. In spite of the increasing number of dissolutions and the lower rate of authorizations of AECEs, Cuban authorities argue that foreign investment is in a process of consolidation. In February 2002, Foreign Investment Minister Marta Lomas stated: “While Cuba is often blamed for trying to slow down foreign investment, what is happening in reality is the opposite. The country has been concentrating on businesses with results.”13 Early this year, Lomas noted that the main economic indicators of AECEs were positive in 2003 and that the low number of authorizations of new projects was more suitable to Cuba’s current needs in terms of technology, financing, and markets.14 Indeed, several foreign investors are engaging in profitable operations and expanding their interests. It is true that some major foreign companies have had problems in recent years, but none of them has pulled out of the country. For instance, Spain’s Sol Meliá, the leader in Cuba’s tourist sector with equity interest in 4 hotels and 23 management contracts, revealed that the communist island had been one of the most affected destinations in the Caribbean in 2002 as a result of the downturn in tourism after 9/11. However, the company has an expansion plan for its Cuba division that includes a new 240- room hotel under management contract.15 In addition, Brazil’s Petrobras, after ending its oil explorations in 2001 (the wildcat well drilled off Cuba’s north central coast was a dry hole),16 said the decision was temporary and that it was still interested in prospecting for oil in deep-water areas in the Gulf of Mexico. Except in a few isolated cases, not even those companies that have been targeted or sanctioned by the Helms-Burton law of 1996 have divested themselves of their Cuban holdings.17 In short, 342 international economic associations remain active in Cuba and someone must be making money. Cuban experts calculate that, since the authorization of the first joint venture in 1988 until 2003, the total amount of committed FDI is approximately $6 billion, of which around half has already been delivered. 20 The Cuban Central Bank has not provided data on the external sector since 2001, when accumulated foreign direct investment was $1,964 million (see Table 1). Unofficial estimates from Cuban sources put the amount of FDI in 2002 and 2003 at $100 million and $90 million, respectively ($2,154 million cumulative). These figures, if confirmed, represent a slight improvement from the disappointing result of 2001 (only $38.9 million in FDI), but they are still considerably lower than the average annual investment during the 1997-2000 period. Sectors with a significant presence of foreign capital are tourism, energy, oil, mining, telecommunications, and construction. The results of foreign direct investment in 2003 were disappointing. The number of dissolved international economic associations was the highest since Cuba actively began to promote FDI in the early 1990s, while the number of authorizations of new projects was the lowest since 1990. In addition, the amount of foreign capital delivered to the country showed only a modest recovery from the sharp decline experienced two years earlier. However, a few new agreements with foreign partners were signed, some existing investors expanded their operations in the Cuban market, and the presence of AECEs operating abroad has become increasingly important. 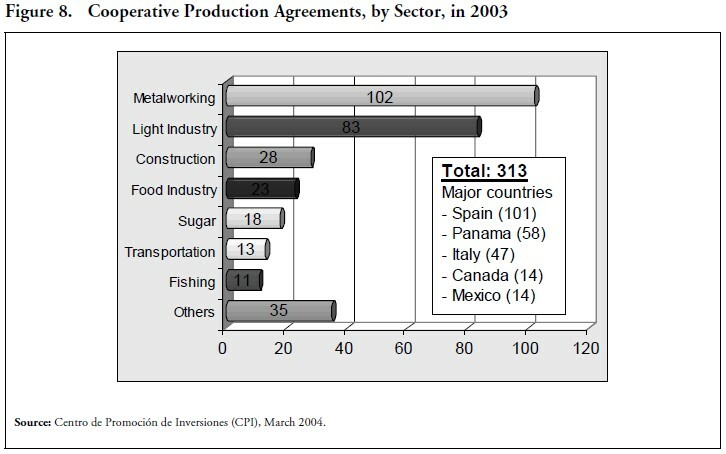 In 2003, a total of 68 international economic associations operating in Cuba were dissolved (Figure 4). Tourism was the most affected sector, with 21 dissolutions, followed by basic industry (12) and light industry (7). Of the AECEs that have ceased to operate, 10 were with investors from Spain, nine from Canada, and six from Italy. Associations with foreign partners from the United Kingdom, France, and Mexico also experienced a decline. Many international economic associations, which were formed in the first half of the 1990s, dissolved because of the termination of the regular contract between the Cuban state and the overseas investor. These were generally small and medium AECEs whose profits had been disappointing, in part because of the lack of adequate financing. In fact, although the Cuban government’s preference for large foreign investment projects might have played a role in this development, it is not a secret that the Cuban partner in joint ventures is often unable to meet its financial commitments. Other associations dissolved because of the anticipated withdrawal of the foreign partner. The existing restrictions on the operation of enterprises, excessive bureaucratic practices, and failure to achieve the planned results seem to be the most common causes. Information from Cuban official sources reveals the existence of many joint ventures with unsatisfactory economic results and corroborates the thesis that the Castro government is indeed trying to consolidate foreign investment by getting rid of unprofitable businesses. Interestingly, it is reported that at the end of 2002, more than 50% of the 403 active AECEs in Cuba did not generate economic results in terms of profits and losses for several different reasons. For the most part, these associations were in the process of dissolution, waiting for additional documentation to begin operations, or performing an undefined social function. 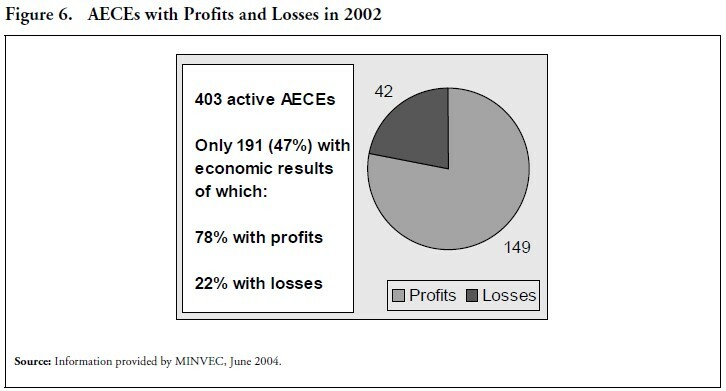 Additionally, as presented in Figure 6, of the 191 active AECEs (or 47% of the total) that generated economic results, 149 (78%) operated with profits and 42 (22%) with losses. In short, only 37% of total active AECEs yielded economic gains to Cuba in 2002, while about 10% ran at a loss. It should also be noted that the beginning of the process of dissolution for several associations was a result of disappointing performances. Thus, it is conceivable that the government took steps to eliminate unsuccessful enterprises. We must remember that some foreign companies are willing to operate with losses as the size of their investments is relatively small and their main goal is to get a foothold in the Cuban economy before the lifting of the U.S. embargo. Rather than taking steps to make its business environment more flexible, Cuba has been moving in the opposite direction during the last year. In mid-2003, the Castro government substituted the use of the U.S. dollar for the convertible peso (a local currency that trades at par with the dollar on the island but has no value outside Cuba) in the transactions of staterun enterprises. Although the AECEs were exempted from the measure, several foreign investors complained about their ability to do business with, and collect payments from, state companies as the latter must hand over their dollars to the Central Bank and buy them back for imports, debt payments, and local purchases from joint ventures.31 Moreover, Havana authorities tightened controls over the accounts of state banks and Cuban accounts abroad, reduced the number of Cuban agencies able to import a selected group of products (creation of purchasing committees or “comités de compras”), and established a fixed 10% markup price over the cost of production in the transactions between state firms.32 In recent months, the Castro government has also begun to reassert central control over the tourist industry, Cuba’s most important economic sector and generator of hard currency (at least in gross terms). Unhappy about loose spending and corruption that have limited profits, Cuban authorities fired in late 2003 several top executives from the island’s largest tourism group Cubanacán. Early in 2004, they replaced the Minister of Tourism, Ibrahim Ferradaz, with Manuel Marrero Cruz, who at the time of his designation was heading the army-controlled Gaviota tourism group. It is reported that these moves are part of a plan to merge most, if not all, activities of four major stateowned corporations that control 75% of the hotel rooms in the island.33 In sum, there is little doubt that Cuba’s shift toward economic centralization and its increasingly regulated business environment will cause further concerns among existing and potential foreign investors. In spite of this situation, the Cuban Ministry of Foreign Investment (MINVEC) reports that seven new international economic associations were authorized in 2003, of which one operates abroad. The new AECEs are linked to the food industry, metalworking, information and communications, civil aviation, fishing, Havana Historian’s Office, and CIMEX real estate. Three agreements were signed with companies from Spain while the remaining four included projects with firms from Canada, France, United Kingdom, and Chile. In addition, some existing investors have expanded their activities in the island. 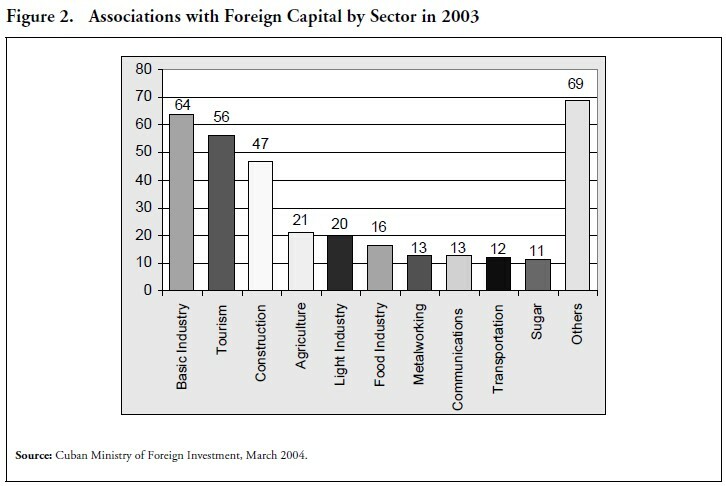 The following are some details of the most important foreign investment operations (completed or announced) in Cuba in 2003, mostly linked to tourism, food and beverage industry, and telecommunications. • In telecommunications, a major operation was completed by ETECSA, a joint venture between the Cuban government and Italy-based Telecom Italia. ETECSA was formed in 1994 and has a monopoly on Cuba’s fixed-line communications and international switching. Between 1994 and 2003, the company has invested almost $800 million to expand and digitalize fixed-line telecom service in the island.43 In February 1998, Sherritt International Communications, a wholly owned subsidiary of Canada’s Sherritt International, purchased a 37.5% interest in the Cuban cellular carrier Teléfonos Celulares de Cuba (Cubacel) for approximately $38.25 million.44 During the first quarter of 2000, the Canadian corporation paid an additional $4 million to increase its ownership to 40%.45 Until last year, Cubacel and another small Cuban carrier, stateowned Celulares del Caribe (C-Com), had exclusive rights to frequencies in the island’s dollarpriced cell phone market, only available to tourists and other foreign visitors. However, in late 2003, ETECSA took over both Cubacel and CCom in a major operation aimed to create an integrated fixed-mobile telecommunications operator and expand the wireless service (in pesos) to the local population. Sherrit International sold its 40% interest in Cubacel for $45.1 million. Telecom Italia, instead, agreed to pay $50 million to finance the merger and retain 27% (down from 29.95%) of the share capital of the new integrated operator.46 ETECSA now has a monopoly on Cuba’s telecommunications sector. In 2003, Cuba’s investments abroad became even more important. Out of 360 active AECEs in mid- 2003, 80 or about 22% were outside Cuba proper (Figure 7). According to Havana’s Center for the Promotion of Investments (CPI), 55% of these associations (mostly joint ventures) operated in Latin America and the Caribbean, 27% in Europe, 11% in Asia, and 7% in Africa. 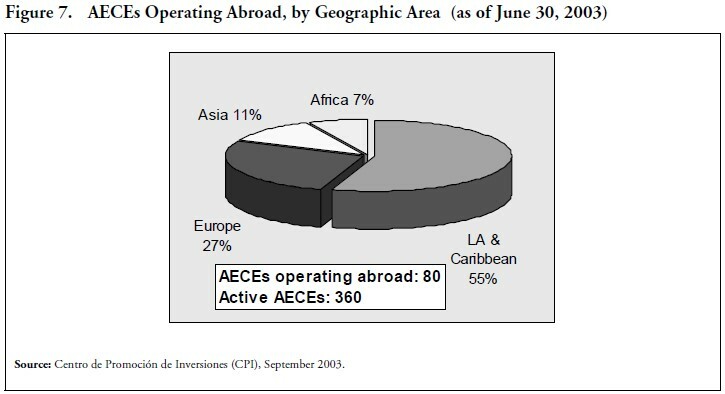 The geographical distribution of AECEs is largely the result of Cuba’s attempt to internationalize its enterprises and increase exports through a new global investment strategy that seeks “to establish companies in developing countries employing Cuban high technology, specialists, and know-how with native manpower.”48 In particular, the island has targeted neighboring markets in the Caribbean region. As observed by CPI, Cuba maintains relations with all Caribbean countries and has established diplomatic missions in most of them “as an expression of the great interest the country gives to the strengthening of the relations with the Caribbean area.”49 However, recent information shows that, with the exception of tourist activities in Mexico and China, Cuba’s most important foreign investment operations abroad have focused on biotechnology and pharmaceuticals projects in East Asia (China, Malaysia, and India), Middle East (Iran), and Africa (Namibia and several other countries).50 Given the island’s enormous potential in these sectors, 51 the Castro government has begun to realize that investments overseas in knowledge-intensive industries and the penetration of new markets may generate good profits and provide alternative hard currency resources for the development of the Cuban economy. 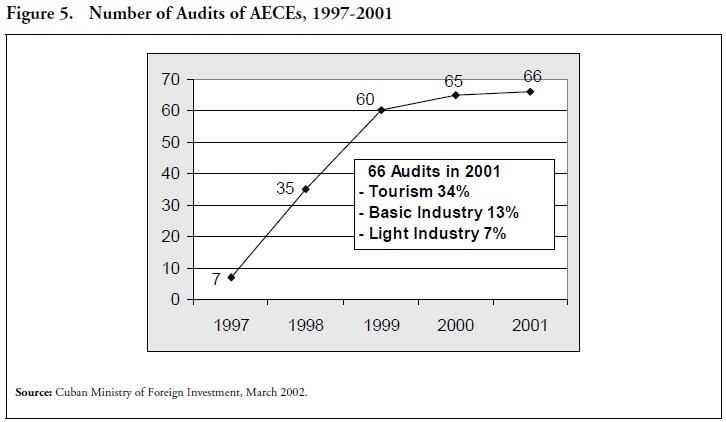 As noted before, the number of AECEs in tourism and basic industry decreased significantly in 2003. Nonetheless, these sectors still present the brightest opportunities for investments in Cuba. A positive aspect is that new agreements were signed in the first half of 2004 and some foreign investors expressed willingness to enter the Cuban market or expand their activities in the island. Here are some details on the most recent developments in 2004. Under the current conditions, it is unlikely that the flow of foreign direct investment in Cuba will show any significant upward trend in the near future due to the island’s rigorous evaluation procedures, its increasing selectiveness toward FDI projects, and its heavily regulated business environment. Although Cuban authorities have continued to encourage foreign companies to discuss the formation of joint ventures (and some agreements were signed), many potential investors either withdraw during the process of negotiations because the terms offered by the Cuban partner are not sufficiently attractive or opt for lower levels of cooperation.59 Overall, it can be expected that some major investors will continue to expand their operations in Cuba and receive important concessions from the Castro government, given the latter’s preference for well-established businesses and partners and for projects involving large amounts of foreign capital. It is also evident that Cuba wants to stimulate foreign investment without transgressing the limits that threatens the control of the fundamental wealth of the nation.60 However, the reality is that the flow of FDI reaching the island will pick up from its current depressed levels only if Cuba promotes a gradual decentralization of its state-dominated economy by introducing profound internal reforms and taking steps to relax existing regulations on the activities of joint ventures and private enterprises. Cuba’s increased selectivity toward foreign direct investment and its preference for large projects in recent years do not mean that small and medium businesses have been halted. They are simply being provided for through different mechanisms, such as cooperative production agreements, regulated by Cuba’s Executive Committee of the Council of Ministers on December 6, 2000 (Agreement N.3827). As with joint ventures, the government says the objectives of these agreements with foreign partners are to obtain capital, new technology and know-how, substitute imports, and gain access to markets. Furthermore, in addition to the increasing number of management contracts in the tourist sector (promoted since the opening to foreign investment in the early 1990s), Cuban authorities have encouraged administration contracts in industrial sectors with foreign partners. This demonstrates that the search for technology and markets is accompanied by a growing awareness of the value of management expertise. Cooperative production aims at solving three major complaints raised by investors in Cuba: the length of negotiations, excessive bureaucracy, and costly dollar payments to their Cuban employees. As compared to an international economic association, the approval of a cooperative production agreement is much simpler and faster (between one and three months), and the documentation required is less rigorous.61 In fact, while the former must be authorized by the Executive Committee of the Council of Ministers or by a government commission designated for that purpose, the latter is simply approved by the Ministry of the Cuban entity. Cooperative production agreements can take many forms. For instance, instead of purchasing equity, a foreign investor can provide capital and sell on credit raw material, technology, and know-how to its Cuban partner in exchange for a fixed sum per unit produced (royalty), or buy the finished product outright for export. These agreements are not too different from international economic association contracts regulated by Law 77. The main novelty, however, is that in cooperative production contracts, workers are paid directly by the government in local currency, and the foreign partner pays no taxes. With foreign companies avoiding to pay for labor in dollars, business operations contemplated by these agreements have been characterized by some investors as a sort of “maquila,” in the style of U.S. assembly plants on the Mexican border.62 Although this is not generally the case, there is also a possibility that a foreign firm is engaged in both a cooperative production and an administration contract, thus having the control of an enterprise and a share of its revenues. Sometimes, a cooperative production might represent the first step toward the creation of an international economic association. While cooperative production with overseas partners has been actively promoted in recent years, foreign investment in Cuba’s free trade zones (FTZs) was virtually halted by Cuban authorities in 2003. Decree Law 165 of 1996 authorized the establishment of industrial parks and free trade zones in Cuba and granted a number of tax and operational incentives to companies making investments in these areas. 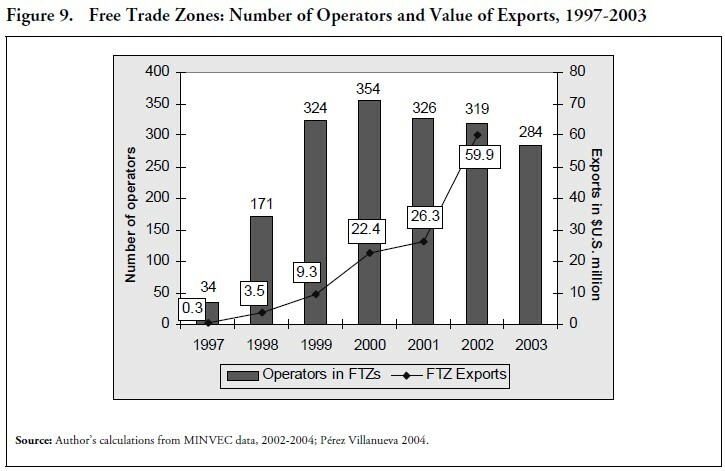 The first FTZs were started in 1997. The main indicators of international economic associations have shown steady growth since the opening to foreign investment in the early 1990s and the impact of FDI on the Cuban economy has become increasingly important. This development appears to confirm that Cuban authorities have been concentrating over the years on investments with positive economic results. A small number of joint ventures has a large economic impact, as many projects with foreign partners in Cuba remain relatively small. According to MINVEC, 30 major AECEs (names were not specified) accounted for 81% of total sales, 71% of domestic sales, and 92% of exports of international economic associations in 2002. Furthermore, 4 major joint ventures — Corporación Habanos S.A., Havana Club Internacional S.A., Compañía Azucarera Internacional S.A., and ETECSA72 — accounted for 47% of total sales, 14% of domestic sales, and 85% of total exports of goods and services of AECEs that year.73 The much lower impact of these enterprises on domestic market sales is not surprising as their revenues come, for the most part, from export-related activities. 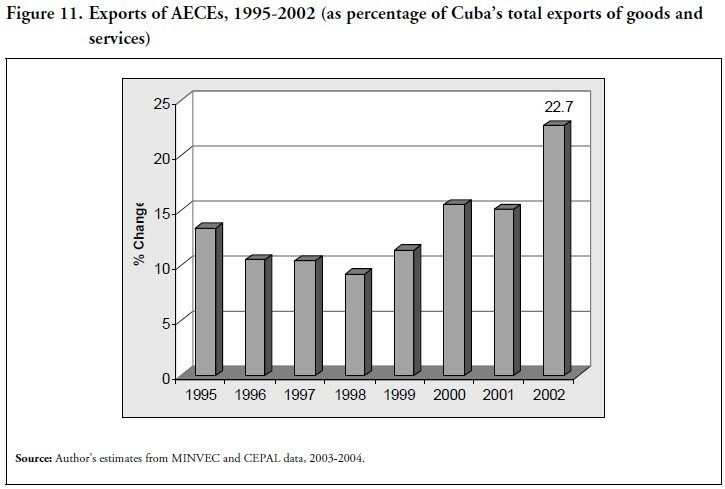 If we also consider the volume of export operations by Moa Niquel S.A., a 1994 joint venture between Cuba’s Unión del Níquel and Canada’s Sherritt International, 5 major enterprises account for almost all export revenues generated through AECEs. In short, the increasing number of dissolutions of international economic associations will have little negative effect on the overall economic performance of FDI in Cuba as long as the big players continue to operate and invest in the communist island. Cuba’s reiterated claims that incoming foreign investment is not crucial to the economic development of the country appear at least questionable. For instance, as reported in Figure 11, the share of export revenues generated through AECEs in Cuba’s total value of exports of goods and services increased significantly in recent years. In 2002, AECEs accounted for almost 23% of the country’s total dollar revenues from all sources. If we consider that FDI in Cuba between 1993 and 2002 represented just 8.7% of gross fixed capital formation,74 the performance of enterprises with foreign participation appears remarkable. In addition, it must be noted that export revenues generated by AECEs are derived to a great extent from products rather than services. The latter may include the sales of joint ventures in the tourist sector (where dollar revenues are mostly linked to management contracts rather than AECEs) and international calls in telecommunications. Today, exports of goods are certainly less important for the Cuban economy than during the 1980s, but they are still a precious source of hard currency for the country. Assuming that all export revenues from AECEs in 2002 were from goods, their share of Cuba’s revenues from all product exports would be about 68%.75 If we add exports from FTZs ($59.9 million in 2002) and those of cooperative production contracts, the importance of foreign investment in Cuba’s total earnings from goods is even more pronounced. 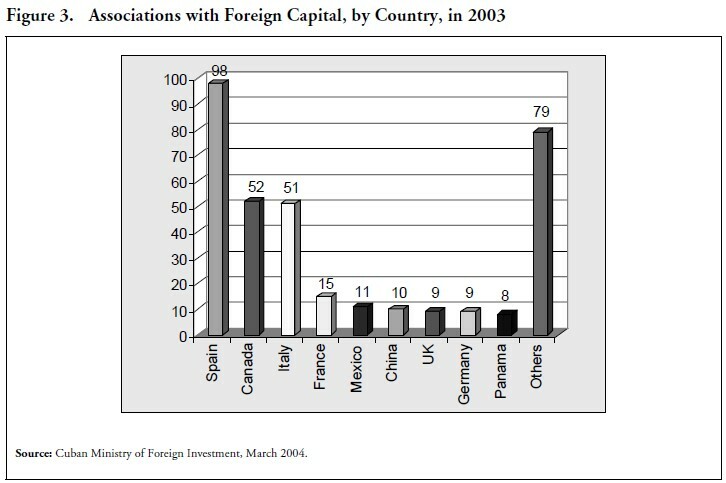 Since 1997, the importance of foreign capital has grown. In the oil sector, Cuban authorities announced that foreign companies have invested around $1.2 billion,77 raising crude oil production from 0.7 million tons in 1990 to 4.1 million tons in 2003.78 Two Canadian companies, Sherritt (50%) and Pebercan (15%), produced approximately 65% of Cuba’s total oil output in 2003.79 Crude oil extracted through exploration activities with overseas firms (along with the introduction of advanced technologies) has enabled the Cuban government to increase domestic production of electricity and natural gas. For instance, the Energas plant constructed with Sherritt in Matanzas in 2000 (cost of the project around $150 million) uses the natural gas released during oil extraction for producing electricity and naphtha. Today, nearly 100% of the country’s electricity is generated with domestic oil.80 In the nickel sector, the impact of FDI on production has been significant. Total foreign investment in nickel has amounted to over $400 million, increasing production from 26,900 tons in 1994 to 72,000 tons in 2003. Just one plant (Pedro Sotto Alba), operated by Moa Nickel S.A. with Sherritt’s participation, produced 32,042 tons in 2003 (44% of total production). 81 In the cement sector, FDI has taken a prominent role thanks to a 50/50 joint venture (Cementos de Cienfuegos S.A.) signed in 2000 between Cuba’s Cemvid and Spain’s Pailas de Cemento S.A. for the modernization of the island’s largest cement plant in Cienfuegos (total investment is estimated at $105 million).82 In tourism, there were 19,960 rooms under management contracts with foreign firms at the end of 2003, representing about 49% of the 40,963 available rooms in Cuba (rooms under joint ventures accounted for 11-12% of the total).83 Finally, foreign participation has a substantial influence over the production and marketing for the five largest export sectors (in terms of gross U.S. dollar revenues): sugar, nickel, tobacco, rum, and fishing. According to the Cuban Central Bank, these sectors accounted in 2001 for more than 32% of Cuba’s total dollar revenues from all sources. Foreign investment has not only helped Cuba to find new markets for its main products but also increased the competitiveness of Cuban production and, therefore, the contribution of import substitution to overall economic expansion. If we analyze sales of international economic associations since 1995 (Figure 12), we can see that the share of exports has been decreasing whereas the domestic market has gained importance. 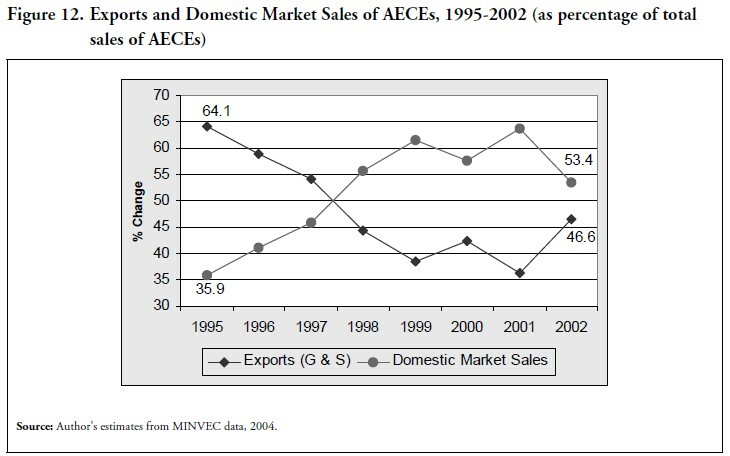 While in 1995 exports represented almost two-thirds of the sales of AECEs, in 2001 they had dropped to around 36%. 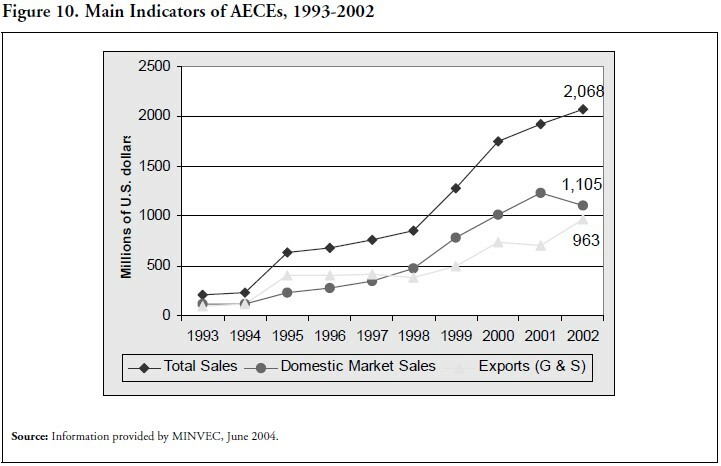 On the other hand, sales in the domestic market have grown steadily, accounting for about 64% of total AECE sales in 2001. The significant increase of exports of AECEs in 2002 is mainly the result of the creation of Compañía Azucarera Internacional and, to a lesser extent, higher revenues from nickel exports. Nonetheless, domestic market sales still accounted for more than 53% of total sales that year. Of course, we are left without knowing the composition of these sales and their impact on import substitution. However, if AECEs have sold in the domestic market goods and services worth more than $5 billion between 1995 and 2002, it is conceivable that such an impact has not been negligible. In the oil sector, foreign capital has doubled Cuba’s refinery capacity and allowed the country to save more than $450 million in oil imports during 2001.84 In addition, the proportion of domestically produced goods provided to the tourist industry has increased from 12% in 1990 to 69% in 2003. Ten years ago, practically all products for hotels and restaurants had to be imported. The development of mixed enterprises in tourism has stimulated the formation of new joint ventures in other sectors (in particular food industry, agriculture, and services) to supply them at low cost. Finally, the share of domestic goods sold to the network of dollar stores has reached 49% in 2003, 85 mainly because of foreign direct investment and cooperative production agreements in food processing and light manufacturing industry. Although Cuban authorities argue that the opening to foreign capital is consolidating, recent figures on authorized and dissolved international economic associations (AECEs) and the flow of delivered FDI to the island show disappointing results. In 2003, the number of AECEs that have ceased to operate was the highest since Cuba began to promote FDI in the late 1980s and the number of authorizations of new projects with foreign partners was the lowest since 1990. The amount of foreign capital delivered to the country remained depressed, with only a small recovery from the steep decline experienced two years earlier. Cooperative production agreements with overseas companies and Cuba’s investments abroad are on the rise, while the development of free trade zones was halted in 2003 due to unsatisfactory results. The current situation of foreign investment is largely the result of Cuba’s increasing selectiveness toward FDI projects and its heavily regulated business environment. Proposed investments are strictly examined in order to assess their contribution to the island’s economy in terms of capital, technology, markets, and management expertise. Cuban authorities are also stepping up control over existing joint ventures in an attempt to eliminate unprofitable enterprises. Meanwhile, foreign investors keep complaining about excessive bureaucratic hurdles, discriminatory applications of business laws against overseas firms, excessive utility costs due to the state monopoly on services, and delays in payments. To further complicate things, Cuba’s recent moves toward economic centralization and the establishment of foreign exchange controls for state-run enterprises have lowered confidence among foreign companies about their ability to operate in the island and collect payments from the Castro government. Nevertheless, there are some positive aspects that should be underlined. The main economic indicators of international economic associations have shown constant progress since the opening to foreign investment in the early 1990s, thus supporting Cuba’s claims that the government has concentrated on investments with positive economic results. Foreign investment has helped Cuba find new markets for its main products, increased the competitiveness of Cuban production, and stimulated import substitution. Overseas companies have a substantial influence over the production and marketing of Cuba’s most important export sectors. Finally, AECEs and new forms of investment such as cooperative production agreements have boosted domestic supply to the tourist industry and to the increasingly important internal market in hard currency. A final comment is that the presence of foreign investment in Cuba has been particularly strong in all the industries that have experienced the highest growth over the past decade such as oil, electricity generation, telecommunications, nickel, and tourism. These sectors are considered by Cuban authorities as the engines of future growth and still offer the brightest investment opportunities in Cuba. In addition, given the island’s enormous potential in knowledge- intensive industries and its supply of technicians and engineers, a potential avenue for the development of the Cuban economy would be to stimulate foreign investment in Cuba in high technology sectors such as electronics and biotechnology. However, it is unlikely that the flow of FDI will show any significant upward trend in the near future unless the Castro government promotes a gradual decentralization of its state-dominated economy by introducing profound internal reforms and taking steps to relax existing regulations on the activities of joint ventures and private enterprises. 1. This paper is mostly based upon field research conducted by the author in Cuba during the summer 2004. The author alone is responsible for the content and interpretations. For further information please contact: spadoni@ufl.edu. 2. Alvarez González, Elena, and Fernández Mayo, María Antonia. “Dependencia Externa de la Economía Cubana.” Instituto Nacional de Investigaciones Economicas (INIE), 1992. 3. Mesa Lago, Carmelo. Breve Historia Económica de la Cuba Socialista. Políticas, Resultados y Perspectivas. Madrid: Alianza Editorial, 1994, p. 223. 4. Hernández-Catá, Ernesto. “The Fall and Recovery of the Cuban Economy in the 1990s: Mirage or Reality?” International Monetary Fund Working Paper, April 2001, p. 4. 5. Pérez Villanueva, Omar Everleny. El Papel de la Inversión Extranjera Directa en las Economías Subdesarrolladas. El Caso Cubano. PhD Dissertation, Havana, Universidad de la Habana, 1998, p. 98. 6. The term international economic association (or simply economic association) refers to the following: joint action by one or more national investors and one or more foreign investors for the production of goods, the offering of services, or both, for profit, in its two forms, which consist of joint ventures and international economic-associations contracts. Joint ventures imply the establishment of a legal status distinct from that of any one of the parties; the proportions of capital stock that should be contributed by the foreign investor and the national investor are agreed upon by both partners and defined as part of the authorization. International economic association contracts do not imply a legal entity separate from those of the contracting parties; each contracting party makes separate contributions, which constitute a cumulative amount which they own at all times, and even though they do not constitute capital stock, it is in their interest to establish a common fund, as long as the portion of ownership belonging to each of the parties is well defined. 7. Confidential Report for the Embassy of Japan in Havana. “Investment Opportunities in Cuba.” Unpublished, March 31, 1999, p. 10 (hereinafter “Confidential Report 1999”). 8. Pérez-López, Jorge F. “Foreign Investment in Cuba in the Second Half of the 1990s.” Paper presented at International Symposium organized by Carleton University and University of Havana, September 28-30, 1999. 9. U.S.-Cuba Trade and Economic Council (USCTEC). “Foreign Investment Policy Change.” Economic Eye on Cuba, February 16, 1998 to February 22, 1998. http://www.cubatrade.org/eyeonr.html#4. 10. Economist Intelligence Unit (EIU). “Foreign investment focuses on large projects.” Country Briefing, February 12, 2001. 11. In 1993, there were 112 active international economic associations in Cuba. This number reached 226 in 1995 and 340 in 1998, peaking at 403 in 2002. 12. Cuban Ministry of Foreign Investment (MINVEC). “Informe de Balance Año 2003.” March 2004 (hereinafter “Informe MINVEC 2003”). 13. Economics Press Service. “Inversión extranjera. Menos de lo esperado, pero…” February 15, 2002. 14. Murguía Delgado, Madelín. “Inversiones y cooperación, fortalezas para el desarrollo.” Negocios en Cuba, March 21, 2004. 17. The law aims to complicate Cuba’s opening to foreign investment by targeting those foreign companies that “traffic” in American properties expropriated during the early days of the revolution. For further details see: Spadoni, Paolo. “The Impact of the Helms-Burton Legislation on Foreign Investment in Cuba.” In Cuba in Transition–Volume 11. Association for the Study of the Cuban Economy (ASCE), 2001, pp. 18-36. In June 2004, the Jamaican tourist group SuperClubs pulled out of two hotel contracts in Cuba after the U.S. State Department said the resort company was trafficking in a property confiscated from Cuban Americans and threatened to deny entry into the United States to senior executives of the firm. United Press International (UPI). “Jamaican firm relinquishes Cuban resorts.” June 17, 2004. 18. Center for the Promotion of Investments (CPI). “Invertir con Cuba.” March 2004. 19. Confidential Report 1999, pp. 3-4. 20. EFECOM. “Expertos encuentran obstáculo en convivencia peso-dólar en Cuba.” July 7, 2004. 22. Interview with a Cuban official in Havana, June 10, 2004. 23. The Cuban government reports that, in addition to 66 audits, about 250 control visits were realized to AECEs in 2001. 24. Economist Intelligence Unit (EIU). “Joint ventures come under scrutiny.” Country Report Cuba, May 6, 2004. 26. Reuters. “Foreign investment in Cuba plummeted to $38.9 million in 2001 from $488 million the year before.” July 8, 2002 (hereinafter “Reuters 2002”). 29. Associated Press (AP). “Cuba responds to complaints from foreign investors.” July 17, 2002. 31. Frank, Marc. “Cuba Central Bank chief says forex control working.” Reuters, September 15, 2003. 32. The formula for state enterprises of selling products to each other with a fixed 10% markup price over the cost of production had been adopted in the early 1990s and then removed due to unsatisfactory results. The reintroduction of this formula and foreign exchange controls aim to avoid excessively high prices applied by state firms that enjoy conditions of monopoly or quasi-monopoly in the Cuban market as well as to reduce costs in the tourist sector, reduce state firms’ dollar expenditures, and increase revenues to the government. Triana Cordoví, Juan. “Cuba 2003.” Centro de Estudios de la Economía Cubana (CEEC), 2004. 33. Frank, Marc. “Castro reins in Cuban tourism.” Reuters, July 13, 2004. 34. Sol Meliá. “2003 Annual Report.” http://www.solmelia.com/sol/pdf/financials/English/Memoria2003INGL.pdf 35. Economic Mission of the French Embassy in Havana. “Convention du Tourisme Cuba 2003: Horizontes Hoteles a l’honneur, avec l’inauguration de l’Hotel Palma Real.” Lettre de la Havane, N. 26, May 2003. 36. Economic Mission of the French Embassy in Havana. “Bouygues: une présence toujours plus forte sur l’île.” Lettre de la Havane, N. 29, September 2003. 37. Economic Mission of the French Embassy in Havana. “100 MUSD pour une nouvelle brasserie.” Lettre de la Havane, N. 24, March 2003. 38. Oramas, Joaquín. “Cristal accepts the challenge.” Granma International, April 4, 2003. 39. Directorio Turístico de Cuba (DTC). “Nestle group gains ground in Cuban market.” May 14, 2003. 40. Pérez Villanueva, Omar Everleny. El Papel de la Inversión Extranjera Directa en el Desarrollo Económico. La Experiencia Cubana, Centro de Estudios de la Economía Cubana (CEEC), 2003, p. 91. 41. Economic Mission of the French Embassy in Havana. “Nouvelle ligne de conditionnement pour Los Portales S.A.” Lettre de la Havane, N. 27, June 2003. 42. Economic Mission of the French Embassy in Havana. “Palmadis: j-v franco-cubaine pour la commercialisation de produits alimentaires cubains en Europe.” Lettre de la Havane, N. 31, November 2003. 43. Pérez Villanueva, Omar Everleny. “The Role of Foreign Direct Investment in Economic Development: The Cuban Experience.” Forthcoming, 2004 (hereinafter “Pérez Villanueva 2004”). 44. Reuters. “Canadian Firm Buys Stake in Cuban Cellular Phones.” February 28, 1998. 45. Sherritt International Corporation. “Annual Information Form.” March 15, 2001. 47. Information provided by MINVEC, June 2004 (hereinafter “MINVEC 2004”). 48. Cuba Transition Project (CTP). “Cuba’s Investments Abroad.” Focus on Cuba, Issue 50, December 17, 2003 (hereinafter “CTP 2003”). 49. Centro de Promoción de Inversiones (CPI). “Potencialidades para la Inversión de Cuba en el Exterior.” September 2003. 50. For further information on specific foreign investment operations abroad by Cuban enterprises see CTP 2003. 51. Since the early 1990s, Cuba has invested heavily in the development of its biotechnology and pharmaceuticals industries. It is well known that the island’s scientific knowledge base and the quality of its programs, laboratories, and products are extremely advanced by international standards. Cuba boasts more than 40 biotech institutions, clustered mostly in the fringes of Havana, and about 7,000 scientists. Vaccines and other medical products are exported to more than 50 countries, helping the industry to obtain about $100 million a year in hard currency revenues. Sample, Ian. “Cuban cocktails.” The Guardian, March 30, 2004. Also see May Yee, Chen. “Cuttingedge biotech in old-world Cuba.” The Christian Science Monitor, April 17, 2003. 52. Economic Mission of the French Embassy in Havana. “Les groupes hôteliers espagnols renforcent leur présence sur l’île.” Lettre de la Havane, N. 34, March 2004. 53. Economic Mission of the French Embassy in Havana. “Bouygues remporte un nouveau contrat hotelier: Dunas III et IV.” Lettre de la Havane, N. 35, April 2004. 54. Reuters. “Petrobras to build $20mln Cuba lubricants plant.” July 6, 2004. 55. CubaNews. “Lula signs $200m in deals with Fidel.” October 2003, p.11. 56. Marx, Gary. “Spanish oil well off Cuban coast comes up empty.” Chicago Tribune, July 29, 2004. In the case of a major light oil discovery, Repsol’s operation would become the most important FDI project in Cuba to date and give a significant boost to the Cuban economy. 57. Wong, Craig. “Cuban nickel boost crucial: Sherritt CEO.” Toronto Star, March 5, 2004. 58. Pagés, Raisa. “Business with China in nickel, rubber, and oil prospecting.” Granma International, January 26, 2004. 59. Economist Intelligence Unit (EIU). “Decline in joint venture numbers is confirmed.” Country Report Cuba, February 13, 2004. 61. The MINVEC reports that the average time of negotiations for AECEs in 2003 was 10.3 months, as compared to 10.8 months in 2001 and 11.1 in 2000. However, this is still longer than elsewhere in Latin America. 62. Frank, Mark. “Cuba adopts two-track foreign investment policy.” Reuters, August 26, 2001. 63. Centro de Promoción de Inversiones (CPI). “Invertir con Cuba.” March 2004. 64. Economist Intelligence Unit (EIU). “Other forms of co-operation are pursued.” Country Report Cuba, May 6, 2004. 65. Cuban Ministry of Foreign Investment (MINVEC). “Informe de Balance Año 2001.” March 2002. 68. Marquetti Nodarse, Hiram. “El Proceso de Dolarización de la Economía Cubana: Una Evaluación Actual.” Centro de Estudios de la Economía Cubana (CEEC), April 2004. 71. EFE. “Inversión exterior sigue siendo formula alternativa de desarrollo.” January, 25, 2004. 72. Corporación Habanos is a cigar distribution joint venture signed in late 1999 and 50%-owned by the Spanish-French group Altadis. Havana Club Internacional is a 1993 rum distribution joint venture between the French company Pernod-Ricard and Cuba Ron S.A. Compañía Azucarera Internacional is a 2001 joint venture between Cubazucar and an unknown foreign partner, allegedly Parisregistered Pacol, S.A., a firm connected to the British sugar trader E.D. & F Man, for the commercialization of Cuban sugar in the world market (see Frank, Marc. “New Cuban sugar exporter has mystery partner.” Reuters, March 7, 2002). ETECSA is a 1994 telecoms joint venture in which Italy-based Telecom Italia has a 27% interest. The majority of ETECSA’s revenues come from dollar charges applied to incoming international calls, which are considered as exports of telecommunications services. 73. Information provided by MINVEC, June 2004. 74. Pérez Villanueva 2004. Gross capital formation refers to capital used for the production of goods and services. 75. The percentage is calculated from data of Cuba’s National Statistical Office (ONE), according to which the island’s total earnings from product exports in 2002 was $1402.3 million. 76. Pérez Villanueva, Omar Everleny. La Inversion Extranjera Directa en Cuba. Peculiaridades. Havana: Centro de Estudios de la Economia Cubana (CEEC), March 1999, p.119. 77. Luxner, Larry. “Spain’s Repsol-YPF helps Cuba search the waters off its coast for oil.” The Miami Herald, June 28, 2004 (hereinafter “Luxner 2004”). 78. This is almost 45% of the island’s annual consumption of 9.2 million tons in 2003. CEPAL. Política Social y Reformas Estructurales: Cuba a Principios del Siglo XXI. April 2004, p. 11. 81. CubaNews. “Sherritt urges rapid nickel expansion while price is high.” April 2004, p. 15. 82. Economic Mission of the French Embassy in Havana. “105 Millions d’USD pour la cimenterie de Cienfuegos.” Lettre de la Havane, N. 35, April 2004. 83. CubaNews. “Canada still top source of visitors to Cuba.” March 2004, p. 11. 85. Oficina Nacional de Estadísticas (ONE). “Panorama Económico y Social: Cuba 2003.” January 2004.